Fifty-eight Americans were killed in Chicago in August 2010, two shy of the number in Iraq that entire year. This article was reported in partnership with the Investigative Fund at the Nation Institute, with support from the Puffin Foundation. Louis Baggetto contributed data analysis to this report. One of them was South Side resident Damian Turner. A tall, charismatic teenager with a passion for video games and rapping, 18-year-old Turner had cofounded the grassroots activist group Fearless Leading by the Youth (FLY). With it, he campaigned to improve conditions at a city juvenile-detention center. On August 15, he was shot in the back just after midnight at a South Side intersection. He was pronounced dead about an hour later, after an ambulance drove him to a downtown hospital. The next week, about a month before Turner would have turned 19, friends and family packed the nearby St. Andrews Temple for his funeral, where they received copies of his rap mixtape. “People really didn’t want to listen to it, because they were going to cry,” recalled Turner’s stepsister Alexssa Moore. Turner’s homicide—the result of a stray bullet from a drive-by shooting—was one of 436 in Chicago that year. But it stirred a city in which activists, politicians, and medical experts were already grappling with the absence of trauma care for the victims of gun violence on the South Side. After Turner died, FLY made his 10-mile ambulance trip downtown its signature issue. On what would have been Turner’s 19th birthday, members of FLY and its parent organization, Southside Together Organizing for Power (STOP), held a rally in front of the University of Chicago Medical Center to call for the opening of a facility that would treat severely injured patients. The state-of-the-art medical complex, which touts itself as “The Forefront of Medicine” and is backed by a $782 million endowment, sits in the affluent neighborhood of Hyde Park, just four blocks north of the weedy intersection where Turner was shot. But like many other South Side shooting victims, Turner traveled downtown, to the trauma center at Northwestern Memorial Hospital. Often, the victims of traumatic injuries—caused by such things as car crashes, shootings, and falls—are taken to the nearest trauma center, hospital operating rooms equipped with cutting-edge tools and teams of specialized surgeons. Severely injured patients are 25 percent less likely to die if they receive treatment at a top-level trauma center than if they are treated in an emergency room. But it’s been 25 years since the South Side has had one. The University of Chicago Medical Center closed its adult trauma center in 1988, after only two years of operation. And in 1990, the South Side’s last adult trauma center closed. Today, the only four adult trauma facilities within city limits are downtown and on the North and West sides. FLY has argued that the university’s lack of an adult trauma center fuels a serious health inequity, disproportionately affecting black youth in some of the city’s most violent neighborhoods. Since 2010, FLY’s fight for the University of Chicago Medical Center to open a trauma center has mushroomed into a full-blown movement, fueled by support from doctors, students, religious leaders, and union nurses who are convinced that a South Side trauma center would save lives. Representative Bobby Rush of Chicago—who introduced a bill in Congress in 2013 that would have appropriated $100 million in federal funds for trauma centers—lays part of the blame for his own son’s shooting death in 1999 on the University of Chicago’s lack of a trauma center. “The fact that a community that’s home to about 750,000 people on the greater South Side of Chicago—an overwhelming portion of which sits in my congressional district—does not have one, not one, Level I trauma-care center literally results in the needless loss of life for far too many of us,” Rush testified before Congress in 2011. In 1984, years before Michael Jordan was a household name, Chicagoans were getting excited about another, younger homegrown basketball star: Ben Wilson, who had been named the best high-school player in the country. But the 17-year-old athlete’s career was cut short after he was shot twice outside his high school—less than five miles away from where Turner was shot—and operated on more than two hours later at a hospital without a trauma center. Nine Chicago-area trauma centers banded together to form a network two years later, to direct ambulances to the closest, most appropriate care available. Although several hospitals have since left the system, one of the architects of the original network, Dr. Gary Merlotti of Chicago’s Mount Sinai Hospital, insists that the city suffers from neither an insufficient quantity nor quality of trauma centers. Activists calling for a South Side trauma center agree. But it wasn’t until two years ago that they could point to hard data to make their case. A 2013 study, led by Northwestern University trauma surgeon Dr. Marie Crandall, found that Chicago gunshot-wound victims more than five miles away from a trauma center were likelier to die. She dubbed these regions “trauma deserts.” According to a Nation analysis of city data, nearly a fifth of Chicago residents live five or more miles away from a trauma center, most of them on the South Side. And between 2001 and 2013, more than a third of the city’s homicides and shootings have taken place more than five miles away from a trauma center. “I found that particularly with life-threatening gunshot wounds or stab wounds to the heart or to the chest, that I wasn’t saving those folks that I might have saved when I was a resident,” said Crandall, whose curiosity was sparked because the majority of her downtown hospital’s gunshot-wound victims hail from the city’s South Side, more than a dozen miles away. Another study, published last year and led by Dr. Renee Hsia of the University of San Francisco, focused on California. It determined that victims of all types of traumatic injuries were 21 percent more likely to die if their driving time to a trauma center increased after the closure of their nearest facility. In fact, the idea that trauma patients who wait longer for treatment are likelier to die is a cornerstone of American trauma care. In 1960, the US Army gave Dr. R. Adams Cowley of the University of Maryland Medical Center a grant to study severe civilian injuries. The researcher—commonly called the “father of trauma care”—used it to open the country’s first-ever hospital trauma unit, a four-bed section dubbed the “death lab,” in which he treated and studied dying patients. Cowley’s observations produced his theory of the “golden hour,” a period after traumatic injury in which medical attention is most likely to save a life. It remains accepted wisdom that trauma patients face a much higher risk of dying the longer they wait for care. The creation of trauma centers grew in tandem with federal involvement in coordinating emergency medical services, driven by the expansion of the national highway system and a rise in automobile accidents. In 1973, President Richard Nixon signed the Emergency Medical Service Systems Act. This led to the appropriation of more than $300 million to develop and expand regional EMS systems across the country. Hospitals joined in, hoping to attract patients, staff, and revenue by investing in trauma centers. By the mid-1980s, however, the trend in some regions had reversed. One major factor was a shift in Medicare reimbursements in 1982: Seeking to rein in hospital bills, Congress switched the program from a retrospective to a prospective payment system, setting average payments for specific classes of illnesses instead of covering the cost of individual Medicare patients’ treatments after the fact. The aim was to encourage cost-effective treatments by letting hospitals keep the difference between actual treatment costs and Medicare payments. But trauma centers paid a price: The initial prospective payments not only failed to account for the severity of patient injuries, but they ultimately put tremendous financial pressure on a hospital’s overall finances. As R. Adams Cowley and his colleagues found in a 1992 study of 44 recently closed trauma centers, this payment shift was cited by hospital administrators as one of the top reasons for the closures of their trauma centers. At a coffee shop in Damian Turner’s neighborhood last April, antiviolence activists Jimmy Poole and Martin Johnson debated the South Side’s lack of trauma care. 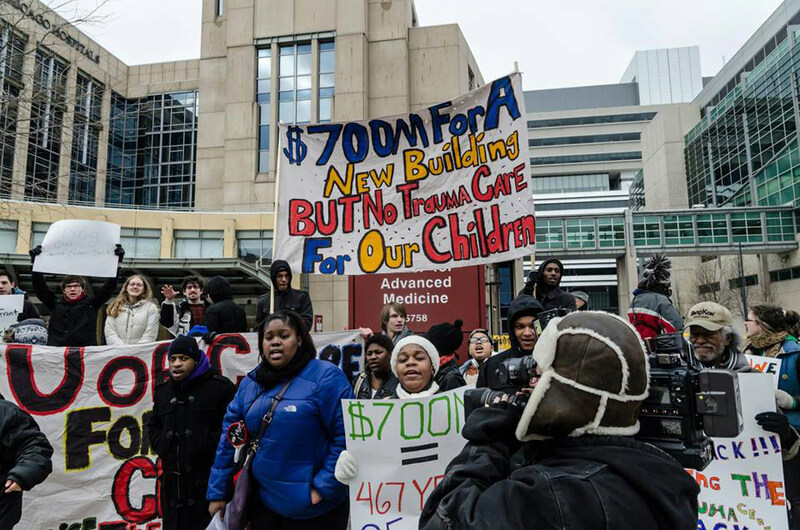 Johnson insisted that the absence of a trauma center at University of Chicago Medical Center was “racially motivated and discriminatory to the poor.” But Poole maintained that it was about cost, not color. ¨You can’t put a number on a moral obligation,” Johnson countered. “No, you can’t,” Poole replied. Then he asked Johnson to imagine the number of people who would come to the only trauma center on the South Side. In 1987, a year before it closed, the UCMC’s trauma center accrued a $2 million loss treating 217 patients—65 percent of them subsidized or uninsured. In the first three months after the UCMC facility closed, most new patients at the South Side’s last remaining trauma center were government-insured or uninsured, and the hospital lost $400,000. The cost of caring for uninsured and government-insured patients is a major factor in a trauma center’s profitability. Because patients by law cannot be denied care once at an emergency facility, trauma centers have no choice but to provide care, whether it pays or not. “The major challenge with keeping trauma centers open is the financial aspect: If you’re not seeing the cases that are paying your bills, it’s very difficult to keep a trauma center solvent,” says Ian Weston, executive director of the advocacy group American Trauma Society. According to estimates by the Trauma Center Association of America, the cost of treating uninsured trauma patients alone is at least $230 million a year. Penetrating trauma—which includes gunshot wounds and stabbings—is more common among uninsured patients and at urban trauma centers. HCA’s openings stand in stark contrast to the closings on the South Side, where a well-endowed nonprofit institution like UCMC may be able to cover the losses incurred by treating uninsured trauma patients, but lacks any financial incentive to do so. “This sign behind is more than a sign. it’s a prescription for the University of Chicago,” FLY activist Veronica Morris-Moore told a May 2014 rally of some two dozen activists flanked by reporters and cameras. Unfurled near the medical center’s entrance was a banner reading Rx Prescription, with the words Trauma Center Now below it. So far, FLY’s prescription has proved a bitter pill, one that the university is unlikely to swallow. So what can be done for the South Side and similar communities across the United States? Jennifer Ward, president of the Trauma Center Association of America, argues that one solution is ensuring that everyone has a right to high-quality trauma care, just as they do police, fire-fighting, or ambulance services. “I think that the country needs to understand that trauma-center care should be categorized in the same way as any other public good,” she says. The Affordable Care Act may reduce the number of uninsured trauma patients, which in turn might help trauma centers better handle their costs—but only in those states that don’t opt out of Medicaid expansion. Some states already subsidize uncompensated trauma care with taxes on cigarettes (Hawaii) or fines on driver offenses (Texas). But in those states, the safety net for financially vulnerable trauma centers with a large population of uninsured patients remains tied to state economies and budgets. Federal funding could ease the burden. In 2010, Congress passed legislation authorizing $100 million every year through 2015 to help cover the cost of uncompensated trauma care. Yet Congress never appropriated those funds, even in the wake of the 2011 shooting of Representative Gabrielle Giffords (D-AZ), who survived thanks to treatment at the only Level I trauma center in southern Arizona. From the top down, advocacy for federal trauma-care funding has fallen on deaf ears. President Obama has never mentioned trauma centers in any of his proposed budgets. And since fiscal year 2010, trauma centers have never appeared in any of Congress’s appropriation bills. Funding may be on the way: In March, the House of Representatives passed the Access to Life-Saving Trauma Care for All Americans Act, which would authorize $100 million in grants for uncompensated trauma care through 2020. As of press time, the bill—introduced by Representative Michael Burgess (R-TX)—has been referred to the Senate. Even if the bill passed, Congress would still need to appropriate the funds, which would cover only a portion of the country’s uncompensated trauma-care costs. But in the meantime, injury will continue to strike often and without warning, and its unluckiest victims will remain at the mercy of hospital balance sheets. Jeffrey Bishku-AykulJeffrey Bishku-Aykul is a reporter for the Hyde Park Herald, a community newspaper on Chicago’s South Side.